Assemble at Chennai International Airport at evening 0600 pm to board a flight to Rio De Janeiro via Dubai by Emirates Airlines. Departure at 2130 and arrive Dubai at 0030 am. Depart from Dubai at 0710 am and arrive Rio De Janeiro at 1430 pm, after completing airport formalities transfer to Hotel and Check in and stay for 3 nights at Hotel Windsor Palace on Copacabana Beach. Proceed for City Tour of Rio De Janeiro – First head to Sugarloaf Mountain for an unforgettable ride, continue to the top of Sugarloaf, where you can see the whole Guanabara Bay, its islands, the Rio Niteroi Bridge, and Corcovado Hill. Sightseeing continues with a tour of Rio’s historical past. Learn how Portugal’s prince Dom Pedro I scandalously broke all family ties and declared himself Emperor of Brazil, as you see the sites of Rio de Janeiro. On the way to downtown, drives through Parque do Flamengo. Pass by the National Library, the Opera House, and get a sense of Rio’s glamour. Later in the evening walk down to enjoy the one of the best beaches Copacabana. Then transfer back to Hotel. Proceed to climb aboard the Tremzinho (cog wheel railway) up to the top of Corcovado Mountain for a bird’s eye view of the Marvelous City of Rio. The World Wonder 38-meter Christ the Redeemer statue, sitting atop Corcovado from an elevation of 710 m (2340 ft), is the image of the faith and friendliness of Cariocas. You’ll also get a close up look at Rio’s Tijuca Forest. Evening is free for nearby shopping around Copacabana Beaches. 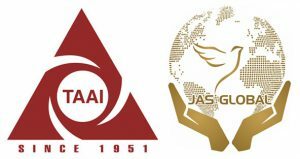 After early breakfast, checkout and transfer to airport for flight JJ 3188 – 0950 – 1202 to Iguassu Falls, Brazil. 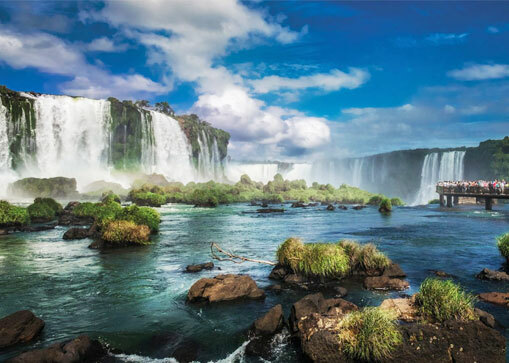 Enjoy a guided visit of Brazil’s Iguacu National Park. After checking out the exhibits in the visitor’s center, take a bus ride to visit various vantage points that will reward you with a panoramic view of the falls. An elevator up to a lookout platform provides a bird’s eye view of this UNESCO World Heritage Site. The most stunning waterfall is the Devils Throat, which spans a 2,700m semicircle that gushes over a height of 72 m (236 ft). Proceed to Bristol Hotel Viale Cataratas for 2 Nights stay. Transfer to Argentina side Falls. 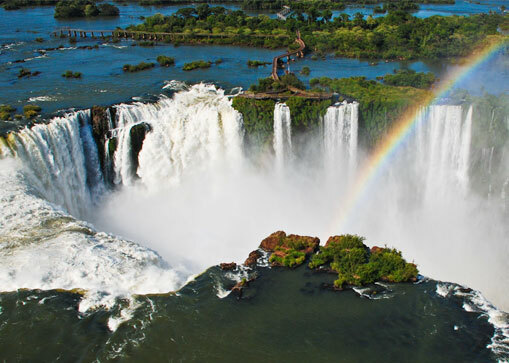 On this visit to Argentina’s Iguazu National Park, you will visit the upper falls, including the San Martin Falls and the Devil’s Throat, visible from a series of walkways that take you right up to the 70 meters (230 feet) tall falls and through the lush forest of the park. Cross the Tancredo Neves Bridge with its lovely view of the Iguassu Canyon in route to the Iguazu National Park in Argentina. Visit the upper walkways which allow a different perspective and more intimate contact with the falls and adjoining rainforest filled with orchids, bromeliads, birds and other wildlife. After that, back to hotel in Brazil. After early breakfast, checkout and transfer to airport for flight LA 7505 – 1020 – 1215 to Buenos Aries. And then transfer to Hotel for Check-in at Hotel Cyan De Las Americas for 2 Nights stay. Tango Dance – Experience a higher level of popular art – Tango, its history, and evolution at the renowned La Ventana Tango house in San Telmo, one of Buenos Aires most traditional neighbourhoods. With the “Gran Orquesta de Juan D Arienzo,” two Tango singers, four dancing couples, music from Altiplano and “Ballet Folklorico.” 30 artists on stage. Enjoy an unforgettable evening! After that, back to hotel in Buenos Aries. Check-out and transfer to Airport to board flight by 0750 to arrive at Cusco by 1602 via Lima by LA 2428, LA 2043. Check-in at our Hotel Terra Andina Colonial Mansion for 3 nights stay. Proceed for City Tour of Cusco (INCAS): – Discover the fascinating historical and cultural legacy of the Incas in the capital of the Inca. Visit Korikancha, known as the Temple of the Sun during Inca Empire, and now the site of the Santo Domingo Convent. Also see the Cathedral, which faces the Plaza de Armas in the heart of downtown Cuzco. Continuing on, tour the ruins of Sacsayhuaman, located above the city, and can enjoy spectacular views of Cuzco below. Follow the road up to several other Inca stone ruins, including Q’enqo, Puca Pucara and Tambomachay. At the end of the tour, transfer to hotel. Andean Folklore Show & Dinner: – Take part in one of Cuzco’s spectacular night shows while enjoying a delicious dinner of traditional Andean and international food. During dinner, will be entertained by a local group of dancers wearing native costumes, playing fabulous folkloric music and performing typical dances such as the Andean Huaynos, Sikus, Tuntunas, and the Sanjuanitos! Breakfast and transfer to GRAND TOUR OF MACHU PICCHU: – Have an early breakfast at hotel, and then prepare for the tour of a lifetime to see Machu Picchu, the breathtaking Inca city in the sky. Travel through the Sacred Valley into the cloud forest, where the city of Machu Picchu lay relatively hidden for centuries. The first class Vistadome train, with its glass ceiling, allows you ample room to enjoy the unbeatable scenery as it takes 3 ½ hour journey towards Machu Picchu. The train will takes to Aguas Calientes, the town at the foot of Machu Picchu. Take a short walk over to the shuttle bus station, which will whisk up the mountain to the entrance to Machu Picchu. There will take on a tour of this fascinating city of the Incas. As you gaze in wonder at the expansive stone ruins, steep terraces, and looming cliffs, will realize why Machu Picchu has been called one of the new wonders of the world. The stonework at Machu Picchu is so well engineered that many of the walls are almost perfectly intact since the days of the Incas in the 15th and 16th centuries. After the tour, wander around the ruins on your own, or return to Aguas Calientes. In the afternoon, meet train for the ride back to Ollantaytambo and check in to hotel for the night. An alternative would be to spend the night in Aguas Calientes, and take the train back to Ollantaytambo the next day. After breakfast, checkout from the hotel. Transfer to Airport for your flight LA 2075 – 1155 – 1300 to Puerto Maldonado. Arrive at Puerto Maldonado airport and enjoy the 3-day Amazon journey. Head to the office, where will have the chance to leave the luggage and will not need during your stay in the Amazon. There is some free time to visit Puerto Maldonado and its Grau Square. Stay for 2 nights at Corto Maltes Amazonia Lodge (3 Days Program): – Go to Capitania Port to take a boat ride, navigating approximately 40 minutes on the Madre de Dios River until arriving at Corto Maltes Amazonia Lodge. Enjoy a welcome cocktail and a delicious lunch made by the lodge’s French chef. After some free time to explore the lodge and its facilities, go on first jungle trek. We can see the tropical trees and medicinal plants that made up the fauna of the place. You may also spot butterflies, insects, birds, and other animals along the way. Stop at a lookout ideal for taking pictures. In the evening, before dinner, take a boat to admire the exotic nocturnal fauna. Try to spot the white caimans that live on the river banks and feel the tranquillity of the sounds of the night. 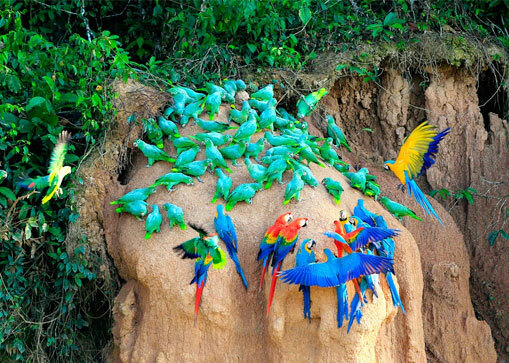 Rise early to visit one of the highlights of the Peruvian Amazon, a Parrot Clay Lick. Here a minimum of five different species feeds on special clay, vital to their metabolism. It’s a truly marvellous, multicoloured spectacle. After breakfast and some free time to swim in the pool or walk through the gardens, head to the port to navigate the Madre de Dios River to discover the Monkey Island. Capuchin, spider, and squirrel monkeys inhabit this island, among other exotic species that you might encounter. Afterwards, navigate for about 30 minutes more to arrive at the Tambopata-Candamo National Reserve, home to giant, ancient trees, snakes, monkeys, colourful birds, and jaguars. Explore the Sandoval Lake, a privileged setting where can see many birds and animals. One of the most intriguing creatures in the Amazon is the hoatzins, an endemic South American bird that has claws on its wings, and a feature that most birds have lost through the evolution process. Among the fish, see carnivorous piranhas and Giant Arapaimas. Return to the lodge to indulge in a tasty meal and take the rest. Visit the local market to see the agricultural products of the region Puerto Maldanado, especially fruits of the Amazon. Then, transfer to Airport for flight LA 2074 – 1345 – 1645 to Lima. Meet and greet by the guide will join to the airport to board a flight to next destination in South America. Arrive Lima, transfer to downtown Lima. Visit Lima’s highlights on a city tour. Start in the historical district, featuring the Main Square, the Cathedral, the Archbishop’s Palace, and the Government Palace. Later, visit the Monastery of San Francisco or the Convent of Santo Domingo to admire the quaint colonial architecture of these buildings and learn about the influence of Catholicism in the country. Tour the residential districts and finish off at Miraflores, located on the coast, the most modern and commercial part of the city. Enjoy a marvellous view of the Pacific Ocean. Transfer to Hotel & Suites Allpa for 1-night stay. After Breakfast, Check-out and transfer to airport for flight LA 2377 – 0905 – 1715 to Sao Paulo. Transfer to Hotel Tulip Inn Sao Paulista for 01-night stay. After breakfast, checkout from the Hotel. And then proceed for City Tour of Sao Paulo. Visit the historical district and its landmarks such as Paulista Avenue, the Liberdade Japanese district, the Se Cathedral, Patio do Colegio where Sao Paulo was founded by the Jesuits, and the financial district of São Paulo with its Art Deco and neo-baroque architecture. Transfer to airport to board a flight EK 262 from Sao Paulo to Chennai via Dubai. Depart at 0125 am and arrive Dubai at 2255pm. Board a flight EK 544 departure at 0245 am and arrive Chennai by 0825.